Click the item icons on the left to add them to your virtual storage unit and we’ll calculate the size of unit you’ll require. Note: to add multiple quantities of the same item, click the item in again. Would you like a detailed quote personalised to your specific requirements? Your detailed quote will show all discounts available for your selection. By providing your email address, you are agreeing to receive emails from Store-Safe regarding your storage enquiry. Are you looking for a secure storage service that won’t break the bank? Do you need a company that guarantees a quality service despite its low self-storage prices in Stoke on Trent? We know that all our customers have different requirements, which is why we offer storage units in a broad range of sizes. Moreover, our fully insured and highly experienced moving specialists are here to make your life as straightforward as possible, whether that means packing your items securely or transporting them on your behalf. 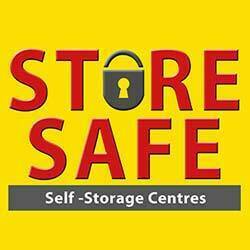 Here at Store-safe, we’re a family-run business that’s been keeping furniture, household possessions and commercial equipment secure for a variety of clients for over 30 years, making us the longest-established storage company in the area. Learn more about our storage solutions in Stoke on Trent by calling us today. At Store-safe, you can keep your valuables secure for as long as required, whether it’s just a few weeks or a number of years. In fact, if you wish to rent one of our units for more than six months, you’ll get a special discount. Our units vary in size from 40 to 320 square feet, and our professionals are more than happy to recommend the most suitable solution for you. If you just have a few items you need to keep secure, such as the furniture from a flat or a single room in a house, then a 40 sq. ft unit may be appropriate. However, if you need to temporarily store the contents of a large family home, then you may need to consider renting a much larger unit. On this page, you’ll find all the information you need to determine which sized unit you require. However, if you have any questions, don’t hesitate to call us on 01782 785 370. If you initially book a unit that’s too small, we can always provide an upgrade when you arrive at our facility. For high-value prices, exceptional customer care and a quality service, look no further than Store-safe.